President Obama has had a rough week. The economic recovery has taken a nose dive with stock market crashes, Standard and Poors downgraded our Credit rating for the first time in history. The 11th District court declared ObomaCare unconstitutional. And a judge threw out an Obaman rules intended to slow down Oil and grass drilling. Polls show his approval ratings are down and all the while candidates are drawing cheers throughout the country while Republicans are having a hayday focusing on how they would do things different. 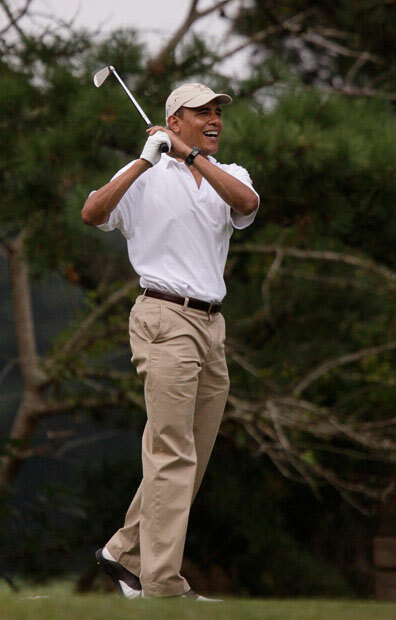 President Obama went and played golf. Cant really blame him. His troubles are beginning to weigh heavily on him. As he explained when He compared himself to Martin Luther King. So President Obama took some time off to do something he doesn’t quite stink at.